School officials in Denair reminded students, parents, staff and community members to exercise caution after more unconfirmed sightings of a mountain lion over the weekend. Stanislaus County sheriff’s deputies were called Friday night to the Country Squire Estates mobile home park on Waring Road after a resident there reported seeing a mountain lion. The park is about a mile west of the Denair High football stadium. There was no game there Friday night. Deputies did not find evidence of the cat near the mobile home park, nor after two other unconfirmed reports Friday and Saturday. On Thursday morning, a mountain lion paw print was discovered more than a mile south of the Denair campus complex. There was another unconfirmed sighting on Sept. 30 on the northern edge of Denair and multiple confirmed reports of a mountain lion in and around Turlock since Sept. 21. Aaron Rosander, superintendent of the Denair Unified School District, recorded phone messages to parents and guardians that were sent Wednesday and Thursday in English and Spanish. In addition to the recorded messages, teachers discussed safety tips in class Thursday and elementary students were told to stay on the blacktop during recess and while teachers and aides stayed on the perimeter. Two-page flyers were sent home with about 1,250 students later that day. Rosander and his staff remain in daily contact with the Sheriff’s Department and state Department of Fish and Game. Fish and Game officials are not sure if the recent reports all are about the same mountain lion, which are known to have territories of up to 100 square miles. There have been no attacks on animals or people reported in Stanislaus County. They prefer deer but, if allowed, will feed on pets and livestock. In rare cases, they have attacked people. In confronted, don’t run. Make noise, stand tall and try to look bigger by raising your arms. If available, throw rocks or other objects at the animal. 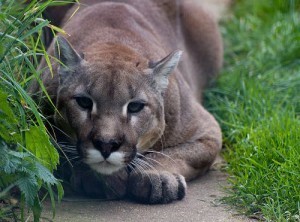 Anyone who sees a mountain lion is asked to call 911. Posted in News and tagged Aaron Rosander, Denair Unified School District, mountain lion.